Immerse yourself in an icy wonderland on a 3-hour trek of hiking and climbing one of Juneau's fabled glaciers. A picturesque helicopter ride transports you from sea level to the glacier, where a professional mountaineer teaches you the basics of glacier travel and climbing techniques. Then, set out on a guided exploration of the glacier's most pristine and remote areas. 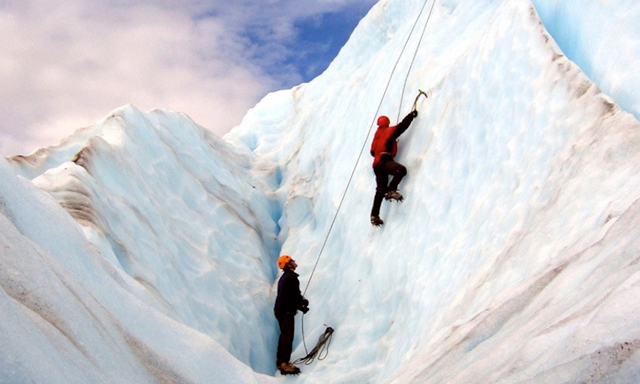 Opportunities for adventure photos abound as you safely climb and descend the ice walls. • Helicopter Flightseeing: Gaze at the natural beauty of the region from an eagle's perspective. • Glacier Trekking: Get up close and personal with the rugged terrain of one of the planet's greatest natural treasures. • No Experience Necessary: Guides teach all skill levels basic climbing techniques and the proper use of mountaineering gear. • Guests are outfitted with windproof/waterproof outerwear, boots, climbing gear and a small backpack with a granola bar and bottled water. • No experience is required but participants should be in good physical condition and have an open mind for adventure. • Approximately 30 minutes flight time. • Guests should consider their physical fitness level and medical history when determining whether this tour is appropriate. • Guests with pre-existing neck, back, knee and/or shoulder injuries, cardiac conditions, asthma, diabetes, epilepsy, other heart or respiratory conditions or any other medical condition should take particular caution when selecting a tour. • Guests who have health concerns should consult with their doctor before engaging in any strenuous activity. • There are certain risks in this type of activity and guests should be aware of these risks before deciding to join this excursion. • Due to flight weight restrictions, all participants must register their body weight at the time of booking. • Guests weighing 250 lbs. or more (fully clothed) will be assessed a weight surcharge of $100.00 to reserve adequate space onboard the helicopter. This is a requirement of the helicopter companies to ensure guest safety and comfort. The surcharge will be manually added to your account. • Guest minimum age: 15 years old.